Winston-Salem State University has a small decline of just 94 students with a Fall 2010 enrollment of 6,333 down from 6,427 in 2009. The largest enrollment at WSSU was 6,442 in 2008. Fayetteville State University declined by 502 students with a Fall 2010 enrollment of 5,781 down from 6,283 in 2009. The largerst enrollment ever as FSU was 6,692 in 2007. The university is 911 students smaller than its peak enrollment. On the other hand enrollment grew at North Carolina's other public HBCUs. North Carolina A&T State University is starting to recover from its highest ever enrollment of 11,103 in 2005 with a current enrollment of 10,795, up 181 students from the 10,614 in 2009. North Carolina Central University is starting to recover from its highest ever enrollment of 8,675 in 2006 with a current enrollment of 8,645, up 58 students from the 8,587 in 2009. Elizabeth City State University has its largest enrollment in the university's history with a Fall 2010 enrollment of 3,307, up 43 from the 3,264 in 2009. UNC Greensboro declined in enrollment with a Fall 2010 enrollment of 18,771, down from 21,306 in 2009. Western Carolina University declined in enrollment with a Fall 2010 enrollment of 9,407, down from 9,429 in 2009. SH*T TALKER BUT IT'S ALL LOVE !! How is this sports related? LOL Nova has a thing for NC HBCU's. Naw he posts about everybody but Skegee. It was posted under the wrong section. Not correct. I post on all universities and not just HBCUs. Check my post and take close notes. Wrong. Check the most recent post on Tuskegee.....guess who posted them? I'm seriously thinking of petitioning Onnidan Webmaster for you to have your own section on here to post more useless drivel. Yes, that's true. I posted this a little while back on Jackson State. One thing is clear. Didn't know so many white students were enrolled at NCCU, Fayetteville State and Winston-Salem State University. Wonder why UNC Greensboro lost so many students. Their enrollment shrunk and they also lost a lot of black students. UNC Chapel Hill also lost black students even though that campus grew in enrollment. Nova, I didn't realize until I looked at your numbers how large an enrollment they have at Fayetteville State and Winston-Salem. They're bigger [in terms of enrollment] than some other Div. 1AA schools. I knew A&T and NCCU had very large enrollments. Indeed, very interesting overall. And to think Fayetteville State has almost 1,000 fewer students than they had a few years ago. Winston-Salem State and Fayetteville State are larger than: Alabama A&M, Alabama State, South Carolina State, Grambling, Hampton, UAPB, Bethune-Cookman, Mississippi Valley State, Alcorn State, Savannah State, Coppin State and UMES. There are a few factors to point to WSSU's surprising increase in enrollment. First, they attracted a dynamic Chancellor a number of years ago in Harold Martin, a Winston-Salem native, who had done some great work in the engineering dept. at NC A&T State Univ. Dr. Martin set some rather high standards and vision for WSSU, with increased enrollment among his top goals. WSSU has a great nursing program, and a relatively new nursing building to boot. I'm not saying he was perfect, but I appreciated Dr. Martin's approach, his uplift and great expectations coupled with good sound timetables. He was (is) a great fan of athletics, too. Simply put, I believe the (undergrad) nursing program and some graduate programs give WSSU a boost in enrollment. 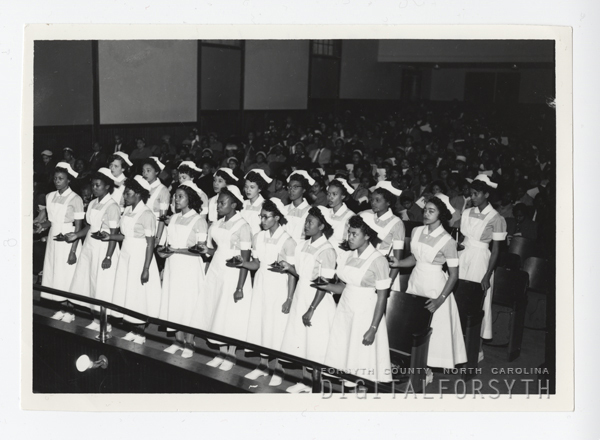 First nursing class capping and pinning ceremony in Fries Auditorium at Winston-Salem Teachers College, 1955 (now Winston-Salem State University). Nursing students hold candles as they stand at the ceremony. The women students wear nurses’ uniforms and starched white caps of the period.